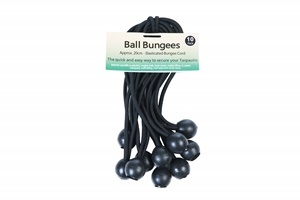 Ball Bungees are a popular fixing method, and assist in keeping your tarpaulin in a fixed position while remaining flexible. Simply feed the elasticated loop through an eyelet so that the ball fits snugly against the eyelet; then use the loop to attach to a fixed point. The diameter of the ball is 25mm. 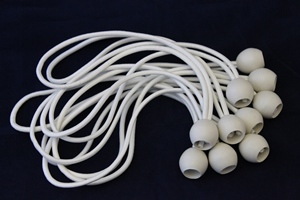 Available in black (20cm) and white (30cm), ball bungees can be bought in multiple pack sizes as below. Now also available in a handy retail pack complete with header card; these are popular when visually merchandised next to tarpaulins.